Friday: Mix of sun and clouds. Highs in the low to mid 30s. WSW wind at 5-10 mph. Friday night: Mostly clear skies with lows into the upper 20s. SSW wind 5-10 mph. Saturday: Unseasonably warm under mostly sunny skies. Highs near 50. WSW wind at 5-10 mph. Sunday: Mostly sunny with highs in the mid to upper 40s. West wind 5-10 mph. The anticipated weekend warmup is nearly upon us. After sunshine ducking in and out of clouds Friday with highs only in the 30s and a breeze knocking wind chill values into the 20s, New England will find a partly cloudy and cool night with lows in the 20s. With a slow increase in atmospheric moisture, some black ice may develop on area roads overnight into Saturday morning, but that would burn off within the first hour or two of Saturday morning sun through wispy clouds. 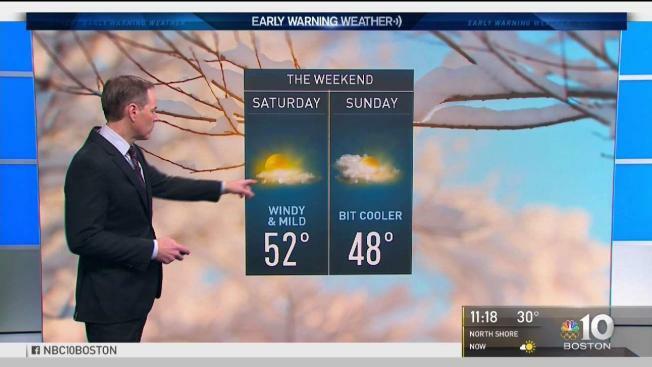 A busy southwest breeze will team with some sun to bump temperatures above 50 degrees in southern New England Saturday afternoon, with 40s more commonplace in northern New England. With the ongoing ice jams along rivers like the Connecticut, a gradual melt is a welcome opportunity to make progress breaking up the jams to avoid significant flooding. Though perhaps not quite as mild as Saturday, Sunday will bring more melting, with high temperatures into the 40s south and 30s north as cool air oozes back into New England, eventually making us cold enough that showers arriving Monday should start as a mix of raindrops and snowflakes. As warm air continues to move into the region, plain rain showers are much more likely Tuesday, with highs nearing 50 before a return to cool and fair weather for the rest of next work week, and a chance of rain or snow next weekend at the end of the exclusive Early Warning Weather 10-day forecast.